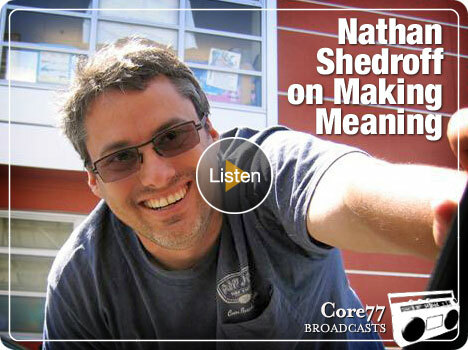 If your interested in the world of “Experience Design” then give Nathan Shedroff, an experience strategists, a listen from core77’s podcast here(45 mins). Otherwise dig into his great publications on his website. As a indusrial designer, I’ve always approached design as a methodology and not as a restrictive definition. I’m not saying restrictions are bad, but it’s bad without knowing what’s allowed, which also let’s you do a ton of different projects. If your a student out there still defining design, check out experience design, because once you figure it out, you can pretty much take on any project ranging from basic product development, business plans, marketing strategies, emotional connections, brand value, and much much more…it’s such a broad and adaptive direction that you’ll be always be learning, trying, and understanding. That’s just my take an love for experience design, which also includes the physical world and not just GUI/web design as most people know it as for some odd reason. Wow…OMG that looks soooo good! I personally loooove eating dragon fruits, but I’ve never seen a flamming pink one like the one above! 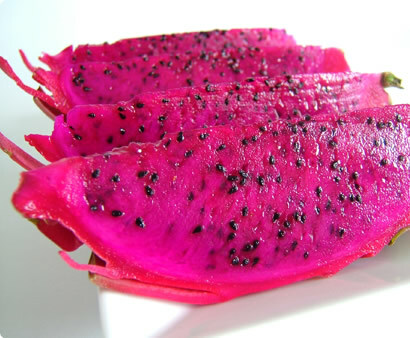 As much as I crave dragon fruits, this picture made me mentally drool. Not only does an image like this capture my attention, curiosity, and thoughts, but it ignites my tastebuds. I’ve always wondered how to extract that magical element in food into product design. Sure, there’s amazing packaging, housewares, utencils, glasses, and items that surround food, but how can product designs in say laptops, pens, chairs, cars, etc make me drool like food does? I’m not sure, but I do believe in the idea of sense being enhanced or triggered by the other senses…like hearing through images, or seeing through touch.Â Here’s a pretty cool thesis bases on that idea called “Synesthesia”. 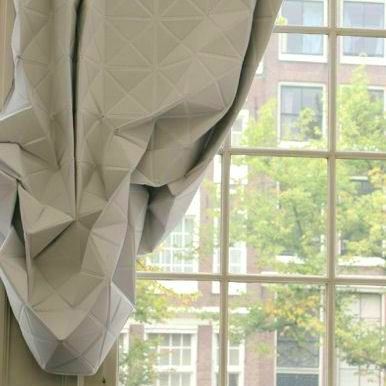 Here’s a great inspirational article/list of 25 online start-ups to watch out for this year. If your an entrepreneur craving to see what’s hot in the web world then this is a must see list. Some services I live by, some I’ve never heard of…Time to start up the trial engine this weekend. CNN’s article here and slideshow of all the groups here. I’ll post all the start-ups briefs after the jump. Here’s another amazing project and video by the beloved urban communicators “Graffiti Research Lab” making a slick and beautiful interaction between a user, a simple green laser pointer, a projector, and some code! This is projected graffiti at it’s best! Here’s a nice Flickr collection from the project. I’m all for making art on buildings with projectors since there’s no damage done though I’m sure a huge flicker of light into your office space can be crazy annoying when your panicking to finish up a deadline without distrations…oh well. Keep it rock’n ya’ll! Last week, Jetblue had a hell of a time with all the news spreading around about the horrific operational meltdown during the frigid weather that gave some unlucky passengers a hell of a crappy waiting experience (waiting in an airplane on the runway for 8 hours)(NYTimes story after the jump). I was stunned to hear this horrible news as I myself think and rate JetBlue as a revolutionary company redefining the airline experience both before, online, during, and after. More details on the jetblue site here. Now, thats a hell of a incentive to book from Jetblue and be rewarded for the airlines delays compared to other airlines. I also read that any passenger booked passenger declined a seat because of overbooking would be rewarded $1000!! !Anyhoots, kudos to Jetblue for setting some new standards again in an age old business that everyone uses! Win a PSP and Game!!! 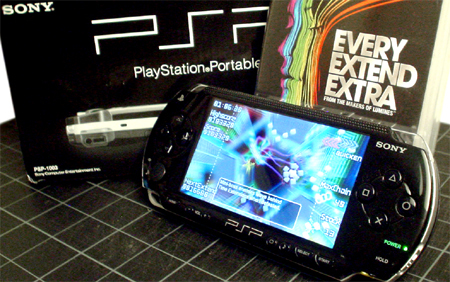 Win a fresh spankin PSP with the game “Every Extend Extra” signed by the guru game designer Tetsuya Mizuguchi! “Every Extend Extra” is a mind-boggling puzzle fighting game packed full of trippy visuals and crazy beats sure to keep you loopy and addicted all day long. I’ve got 1 PSP, and 2 copies of “Every Extend Extra” to give away to readers, including one signed copy, courtesy of BuenaVistaGames. 1. The name of the guru gamer I did pong with last year? Update: Thanks for all the tips and inspirational links from ya’ll. Congrats to EddricÂ L and SarahÂ P for winning the prizes… I’ll have their tips posted soon. 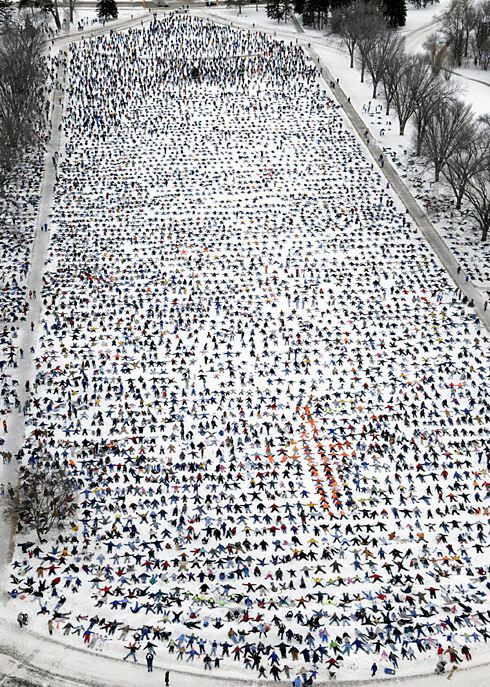 Call it inspirational, funny, or plain cool…..when 9,000 people gather together to make snow angels in a park it makes me smile. The great image reminds me of “Where’s Waldo” though my eyes quickly gravitated towards the flock of orange lined jackets in the center….that would rock if Google Earth captured this over the weekend. Otherwise, it would make a cool micro print. The incredibly fun and rather tough “We All Look the Same” test to differentiate between images of Chinese, Korean, or Chinese people that I posted about before has expanded their face test to several other cultural tests in their “Exam Room“. Besides faces, the test now includes Modern Art, Architecture, Photos, Urban Scenes, Food, and Architectural Details. I took the food test and scored 14/18, but I failed miserably at the Art test with 9/18. Go take the tests and feel proud or miserable about your eye for asian culture. SlingShoting is a MUST do activity sometime in my life!!! Besides the fact that my screaming lungs will be catching up to my bodies slinged off body, it looks like way tooo much fun!